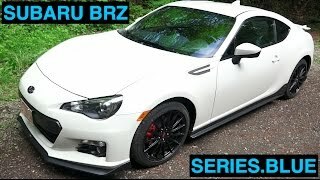 Subaru BRZ made its debut in 2013 and since then Subaru is over its boulevard to present the automotive market, a better sports car. In lieu to this company unveiled its Subaru BRZ Series Blue 2015, a limited edition model with a classy interior inside a body with aerodynamic upgrades. 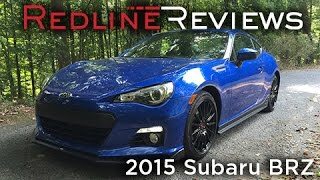 Let us have a closer look at the review of Subaru BRZ Series Blue 2015 and get to know what company has to bring with its limited 1000 models. Interior of Subaru BRZ Series Blue 2015 is housed with host of upgrades. Covered with leather and Alcantara upholstery, model features blue seat bolsters, accents of blue stitching and head restraints bringing the gleam. Right in front of it over the dashboard is mounted a blue and black leather wrapped three-spoke steering wheel. The blend of blue spreads its wings further over the center-console knee pads and door trim while the floor mats come stitched in blue with a BRZ logo in center. Marks of logo can further be noticed on seatbacks adding gleam to the rear passenger vision. In all the interior of Subaru BRZ Series Blue 2015 is a treat to eyes and adding to a touch of sportiness and makes this model special. Exterior of Subaru BRZ Series Blue 2015 goes other way to distinct this model. Out of the 100 models set to release, company will be bringing 500 in WR Blue Pearl paint finish while the rest 500 will come dipped in Crystal White Pearl finish. 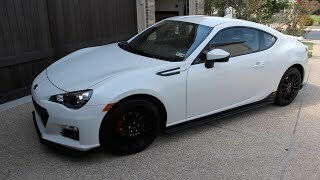 Major emphasis while creating exterior of Subaru BRZ Series Blue 2015 was upon aerodynamic enhancements. Company has added various components like, front, side and side rear under spoilers to achieve the target. Adding not just in increasing downforce, these features also add to the aggressive and sporty looks of the model. To bring the drag coefficient low, company has added underbody panels. Apart from these, rest all remains the way you can expect from company. 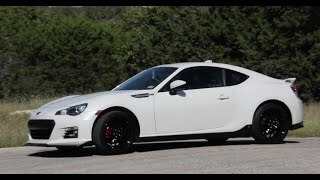 The Subaru BRZ Series Blue 2015 gets its power through a 2.0 Liter 16-valve Boxer engine generating total output of 200 hp and peak torque of 205 nm mated to six-speed manual transmission as standard. However company provides you an option to go for six-speed automatic transmission. With is new upgrades and manual transmission, the Subaru BRZ Series Blue 2015 top speed touch mark of 143 mph.